With anywhere, anyone, anytime, the artist Laurent Moriceau has created a new and parallel space. The proposition is very simple with intriguing results at stake. Creating a flux of images and texts distributed through the means of a limitless network with infinite limits. The work is in complete opposition to social networking. 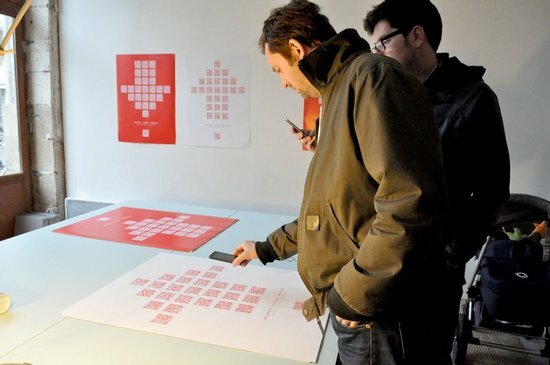 - Poster number 1 allows you to upload images and text through the means of a QR code mosaic by your Smartphone. - Poster number 2 allows you to access to the global uploaded material. - All uploaded material remains anonymous. The distribution of the posters are unlimited, the participants are both unlimited in numbers and international. Anywhere Anyone Anytime is a virtual hydra to infinite networking; capable of receiving and distributing millions of anonymous uploads. The non-hierarchal and uncontrollable flux questions the freedom of expression of institutional social networks. The project also enables mobile telephones to become a performing creative medium, accompanying every moment of our lives. The work is a reflection on medium and the artistic status authorized questioning the impact of the status and the generated context.